Every day, every hour, we can serve Minneapolis, the metro area, and the Twin Cities suburbs. We are towing professionals: Our tow operators are well-trained, friendly folks who care about getting a job done right. Our A+ Better Business Bureau rating means you can feel confident you’ll receive quality service. Whether you need recovery or towing, we have the knowledge and equipment to help you. Need a wrecker or a flatbed? Are you at an accident scene? Do you just need to get rid of an old car? Or is your vehicle stuck off-road? For any of these towing, assistance or recovery needs, we can help. We’re a thorough operation who can provide a wide range of services. We’ve been in business for more than 30 years, and we have a long-term commitment to serving our community. When we help you, we’re not just helping a customer. We’re helping our neighbor. 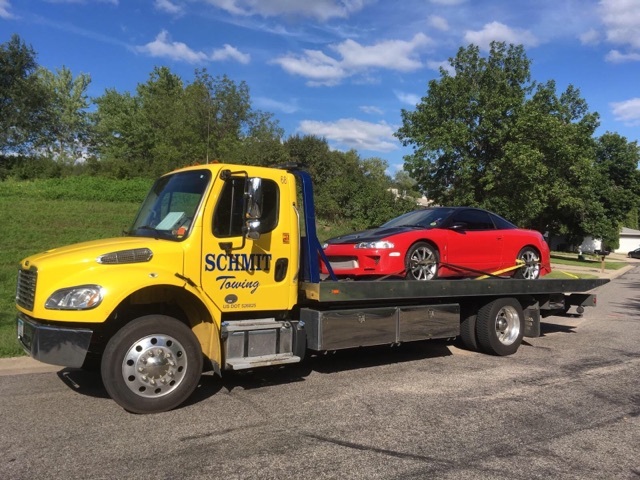 Schmit Towing, providing the Twin Cities Metro and surrounding area with timely response towing services.